It can take up to 2 years for large companies to complete the ISO 27001 journey. Make this journey easier, simplify and automate gaining and sustaining compliance with our ISMS products. Know where to start, how to get there and how to demonstrate your achievement with SureCloud. ISO 27001, the most popular standard in the world for managing information security, benefits small to large organizations alike. Many organizations seek certification to comply with legal, contractual or regulatory requirements but how do you start and then manage the program through to certification and beyond? Additionally, once you gain certification, how do you ensure you maintain it? 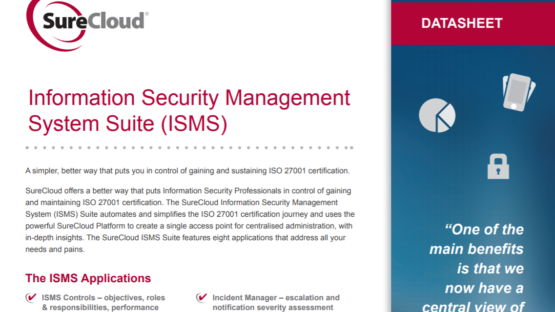 SureCloud’s Information Security Management System (ISMS) Management solution automates and simplifies the process of obtaining and then staying compliant with ISO 27001 certification. SureCloud’s ISMS Management solution provides a framework for bringing together ISO 27001 Policies, Procedures, Metrics, Controls, and Risks. SureCloud’s ISMS Management software then presents this information in a manner which helps internal teams understanding what needs doing and by whom. It also helps reduce the time spent by auditors assuring the ISO framework. Core components reflect best practices of discovery, prioritization, remediation and verification.